At OpenMarket, we understand that launching a new mobile messaging program can be both exciting and stressful. To make the process as efficient as possible, we provide you with various types of support throughout the lifecycle of your program. From initial consulting through program monitoring, OpenMarket aims to make the experience as smooth as possible. This page should help you understand the essential steps in designing, launching, and running a mobile messaging program in the US. By reading this guide before you get started, you'll be prepared to move through the process efficiently and launch your program on time. In addition to the information provided here, refer to the Common Short Code Administration website for details about obtaining and using short codes in the US. 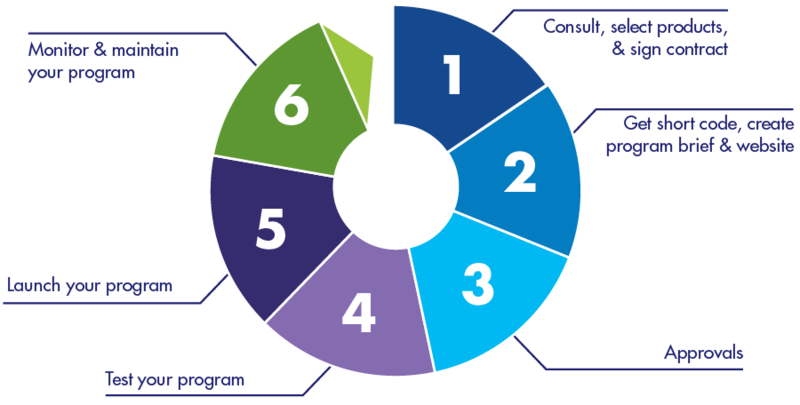 The lifecycle begins with the consultation and contract phase with your OpenMarket Account Director, then commences with program brief development, approval, provisioning, testing and certification. All these steps must be complete before your program is launched. Objective: Ensure that your business and OpenMarket are well matched for a long-lasting, mutually beneficial partnership. During this consultation you'll work with your OpenMarket Account Director to define the objectives of your mobile messaging program. Once complete, contractual details will be finalized and you will sign the appropriate contracts depending on which OpenMarket products you've chosen to use. Objective: Prepare your program brief and build your website. In this step your Account Manager will assist you in obtaining a short code (if you haven’t already done so) and designing a program brief and website. Both the short code and program brief must be complete in order to engage mobile operators for their review and approval. The CSCA—Common Short Code Administration—is the organization that leases short codes. You can lease a short code yourself or we will help you lease one. Please advise us if you have already acquired your short code or you are migrating from another aggregator. Your program brief is a very important document. It describes your mobile messaging program in detail, including the user experience (e.g., call to action, opt-in, opt-out and message flow) and information about how the service will be promoted. Your Account Manager will assist you in developing your brief to ensure that your message flow descriptions are complete and clear, and you’ll have access to our web-based "Campaign Brief" tool where you can provide the needed details. Our aim is to ensure that your program brief is not delayed due to mobile operator questions or requests for information. Your program brief must meet CTIA (Cellular Telecommunications Industry Association) guidelines as well as operator-specific regulations and requirements. Once your program brief and supporting website are complete and compliant, your Account Manager will submit them to mobile operators for approval. The mobile operators will review your program brief and website for compliance to guidelines and regulations. When a mobile operator grants ‘commercial approval’ of your program brief and website, you can assume that you are in compliance. At this point the mobile operator will establish a connection on their network to OpenMarket for your specific short code. When your program has reached this state we say it’s been "technically provisioned". In the case where a mobile operator requests more information, your Account Manager will work with you to make whatever changes are needed to the program brief to ensure its approval. Some mobile operators, including AT&T, Sprint, T-Mobile USA, and Verizon, require certification testing. (Verizon requires testing only for MMS programs.) Your Account Manager will contact you when your program is ready to be certified. An OpenMarket Certification Tester will advise you about whether any message flow changes are needed in order to pass the mobile operators’ test. Assuming your program is compliant, the operator will submit your program for certification and place it in their testing queue. Your service will need to function exactly how it is described in the program brief. It is imperative that no changes to the message flow and website are made during this phase. Any deviation from the information submitted in your program brief will result in delays or possibly a rejection. If you would like to test the service yourself and do not have access to all the necessary handsets, we can help you utilize Keynote mobile testing. Keynote provides access to real handsets on live worldwide networks remotely over the Internet. Step 5: Launch your program! If your program and website behave as expected, you will receive notification that the mobile operator has certified your program. Once certified, you can launch your service and run live traffic! If one or more mobile operators do not certify your program, the OpenMarket Certification Tester will contact you and advise what changes are necessary. Once your mobile program goes live, we still need to monitor it to stay in compliance with industry and mobile operator requirements. Compliance updates — CTIA and mobile operators revise their guidelines from time to time, and you will want to ensure that all of your services remain compliant. OpenMarket will distribute any new guidelines to you via a customer announcement and will be available on our website, enabling you to make the necessary updates to your service (if applicable). Audits — The CTIA audits mobile programs, and will notify you and your OpenMarket Account Manager if it chooses to audit your program. The audit will contain instructions with the changes needed. If you have any questions regarding the audit, your Account Manager will be available for assistance. Changes to service — Please contact your Account Manager in the event of any significant changes to your mobile program. If you need to make any changes, your Account Manager can assist you in amending your campaign. Your OpenMarket team will maintain an ongoing dialog with you about the performance of your program, as well as how you would like it to evolve and what other OpenMarket products and services might enhance your offerings. This may lead back to Step 1, where you and your Account Executive explore a new or amended contract and initiate the lifecycle again. For support during the lifecycle of your short code, OpenMarket provides three direct points of contact. Each of these professionals has a specific area of expertise and is trained to help you through the process. Account Director — This is the person you’ll interact with initially. He or she will consult with you on your mobile strategy, help you decide which products and services to use, and work with you to complete contractual documents. Your Account Director is your ongoing contact for all commercial inquiries. Account Manager — This is your primary, ongoing contact at OpenMarket. Our account managers are very knowledgeable about the mobile landscape and are specifically trained to provide skilled one-on-one consultation. Your Account Manager will help you navigate each phase of the process and help ensure that your program goes live as smoothly and quickly as possible. Support Engineer — OpenMarket’s Support team has won several awards for service excellence. With teams on four continents, we provide 24-hour, year-round and worldwide support. Each support engineer is fully knowledgeable about our products and operations, and anytime you need help you can contact Support and an engineer will promptly respond. In addition, if you choose to utilize our Mobile Engagement Platform and require customized services, you will interact with a Solutions Consultant. These individuals are technical experts with years of experience designing and implementing solutions with unique requirements. Today, with enterprises utilizing mobile in so many new ways, our Solutions Consultants provide the know-how to make innovation happen.